Just in time for Halloween! 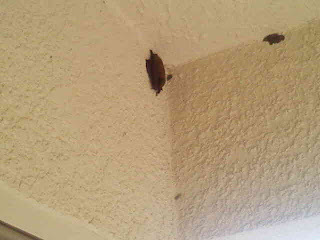 Our very own bat! This is from a Harry Potter swap I am participating in. 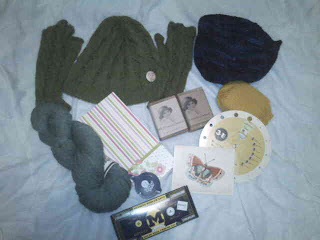 I got a lovely pair of fingerless gloves, a hat to match they are both green my favorite color, beautiful soft yarn from a mill in MI, a bowl which I will be felting, soap in my favorite scents, soap sack, a thread cutter, yummy chocolate, a note pad with stickies in it, and a needle size yarn weight chart. Thank you so much for my package! 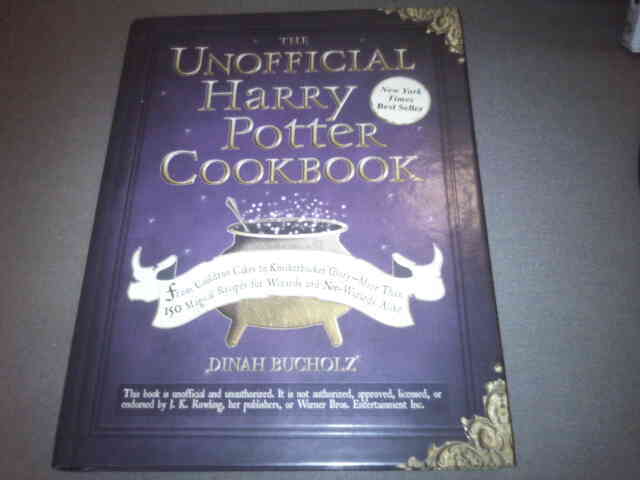 Oh how could I forget The Unofficial Harry Potter Cookbook! I can't wait to cook these yummy foods from the movie with my Best Friend Jill! Come on over Jill, I'm ready! 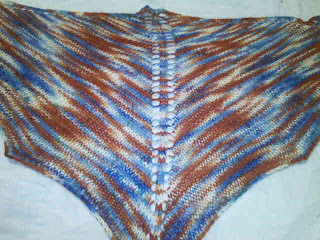 This is a shawl I made with the yarn Cindy got for me for our Birthday. 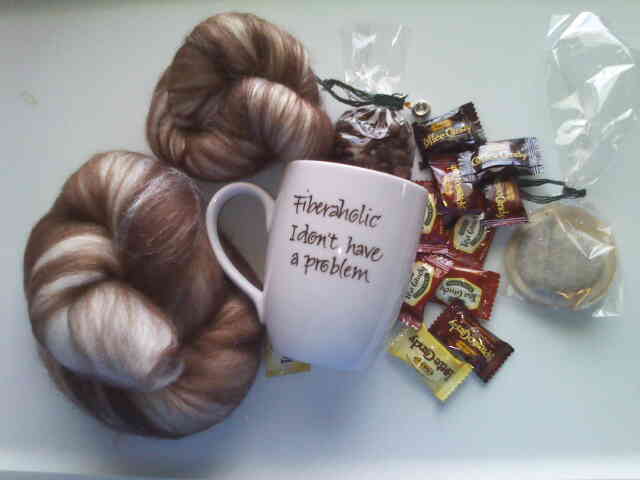 Above is a package I received from Everimprovingme! It is a SAL I wanted to participate in and my parents got it for me for my birthday. 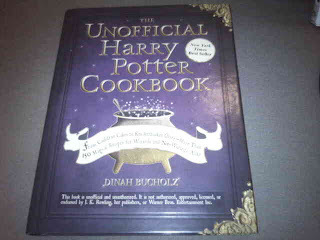 This is an amazing present because I will get so much enjoyment from it. There is coffee beans, tea, coffee and tea flavored candy, a stitch marker, a coffee mug (on the other side it says Twin A!) and lastly 4oz. of yummy Carmel Macchiato colorway that has Alpaca, fine merino, BFL, polwarth, firestar, and bamboo fiber in it! I can't wait to spin this fiber! Thanks Mom and Dad for the awesome Birthday gift! I just love it! Below, is a package I recieved from Shetibo.etsy.com I won a prize in a Tour de Fleece spin along event. This is what I won! a 2 oz. batt of colorway Mermaid Garden! The fiber is Shetland/ with nepps, bamboo,polwarth, N2 romney, faux mohair, and firestar. It is really soft. 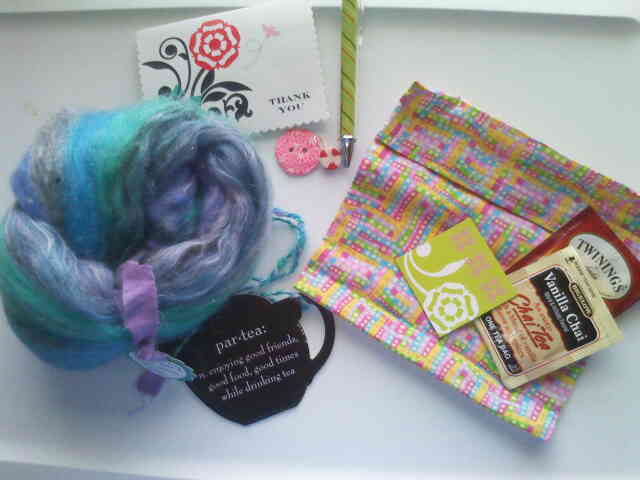 She also sent me a reusable sandwich bag she made, a stitch marker that looks good enough to eat, a magnet,pen, coaster, and some tea which I have already had! Thank you Jess for the prize I just love it! This is the Little Boy Blue colorway from Storied Yarns. 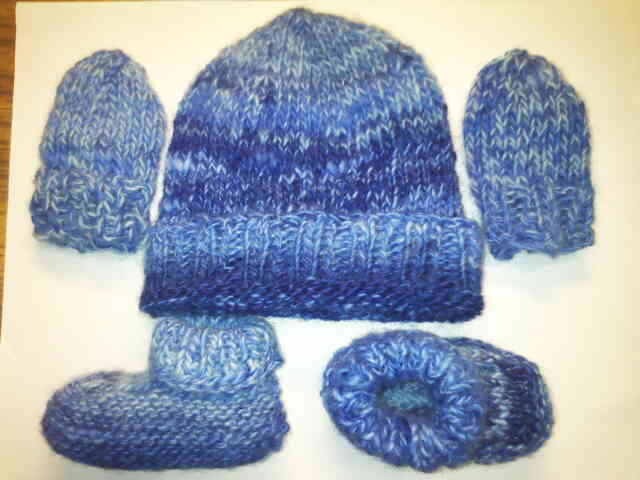 I spun the fiber into yarn on my spinning wheel and then knit it up. 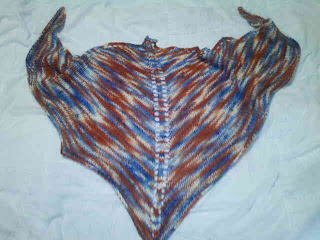 Next i will be spinning more fiber for the sweater to complete the outfit.